George Brown analyses how Transport Scotland are trialing new ways of virtualising Variable Message Signs to provide essential roadside information and warnings directly to in-vehicle infotainment systems, marking yet another step in the journey towards smarter, safer and ultimately more satisfying travel. Providing advice and warnings to drivers via roadside Variable Message Signs (VMS), which range from simple flap-type fixed signs to more complex light-emitting panels, is a long-established practice on motorways and major roads across the UK. VMS are generally perceived as useful and informative; they can reduce drivers’ stress and can contribute to limiting congestion and shortening driving times. However, deploying roadside message signs is expensive and time-consuming, often being effectively limited to critical locations on strategic roads where the cost can be justified. In the meantime, connecting to cars directly to improve the quality and safety of road travel is increasingly at the heart of evolving ITS initiatives across the world. In a bid to make VMS systems smarter and more prevalent, and bring them up to speed with connected technologies while controlling the cost of deployment, Transport Scotland, the national road authority in Scotland, partnered with Cubic Transportation Systems to build a proof of concept connected in-vehicle information system. The goal was to provide driver guidance directly in the car, extending the existing delivery of information and warnings to drivers via physical roadside VMS. The trial focused on delivering in-vehicle, virtual VMS via Traffic Scotland, a real-time traffic information service provided by Transport Scotland. A key objective of the trial was to establish a common architecture for car connectivity that can be effectively deployed across all makes of vehicles in a cost-effective way by relying on existing communications technology and in-car equipment. For the trial, Cubic and Transport Scotland decided to use standard high-performance car head units deployed in most new cars, which support Android Auto, MirrorLink, CarPlay, Ford SYNC, and other device interoperability standards that offer integration between a smartphone and a car's infotainment system. These systems are increasingly provided as a standard feature of infotainment units in new cars, complete with large, touch-screen displays, native applications, radio, CD player, navigation and more. Smartphone integration enables drivers to use a phone application directly on the integrated infotainment system. When connected to the car the phone itself ceases to be directly useable and simply acts as a plug-in extension. Cubic and Transport Scotland focused the trial on MirrorLink, provided by the Car Connectivity Consortium – a non-profit organisation of car manufacturers, smartphone vendors, and aftermarket car electronics providers who collaborate to deploy the connectivity technology in cars. While all the platforms for smartphone integration require a careful vetting process to ensure applications do not provide a distraction for drivers, MirrorLink is an open platform with a clear path to deployment, with testing and certification by an approved external test authority. Other platforms, such as Google’s Android Auto or Apple’s CarPlay are typically more restrictive when it comes to the types of applications that can be deployed. Although that made them unsuitable for the trial, future integration remains an option. Currently, MirrorLink provides access to roughly 25 per cent of new cars in the UK including most VW, Skoda, SEAT, Peugeot, Citroen and Toyota models. With other platforms such as Android Auto, CarPlay and Ford Sync on board it’s possible that virtual VMS may soon be supported by more than 90 percent of current model cars. The concept of geo-gates is key to the virtual VMS system proposed by Cubic. The system works by linking to a cloud server connected to Traffic Scotland, which provides Virtual VMS messages for specific locations and directions of travel through geo-gates — geospatial virtual gates, which can be created anywhere on the road network almost instantly to provide precise advice and warnings to drivers about hazards as well as offer relevant information regarding the route. Geo-gates define detection zones with a size and a direction. As a car approaches a geo-gate in the correct direction, it triggers the system to display and speak a Virtual VMS message. The architecture supports the fast projection of information into the car, with only a few seconds passing between the Control Centre identifying a hazard (for example, a stopped vehicle on a high-speed road) to a warning appearing on the infotainment systems of cars approaching the hazard — similar to conventional VMS. The system uses fast, optimised communications, consisting of short, focused messages to drivers, minimising driver distraction via a tight interface, transferring only the data needed. This rapid process uses limited bandwidth capacity and ensures only low levels of mobile cell data service are required or the system to operate. The display of a virtual VMS in the car is as simple as possible, with high contrast colours similar to those used in roadside VMS. That way, the look and feel of message signs displayed in the car closely aligns with existing driver experience on the road. The main display area shows virtual VMS messages. When a vehicle encounters a virtual VMS en route, the system generates a notification sound, displays a message for 30 seconds and reads it out loud twice. If a second virtual VMS is encountered the first message is displayed below in smaller text. A Link Up (Green)/Link Down (Red) indication shows if the system is connected to Traffic Scotland to guarantee messages are only displayed if the system is live. The connection uses an always-connected technology (SignalR) with link down identified in less than five seconds. A PLAY button (the only driver interaction with the system) plays Traffic Scotland Radio – an Internet-streamed, regularly updated traffic information service for Scotland. If a vehicle encounters a virtual VMS while the radio is playing, the system pauses the radio until the display of the virtual VMS message is complete. After 2000 miles of live road trials in the UK (using the EE network), Cubic identified only three zones, each a few miles long, of ‘link down connectivity’. Testing took place between Birmingham in the South to Inverness in the North (route is shown in green on the map, with locations where connectivity was lost in red). Experience from road testing shows that the virtual VMS system integrates well with the car and provides a seamless driving experience alongside the vehicle’s existing systems, such as media, radio, and navigation. 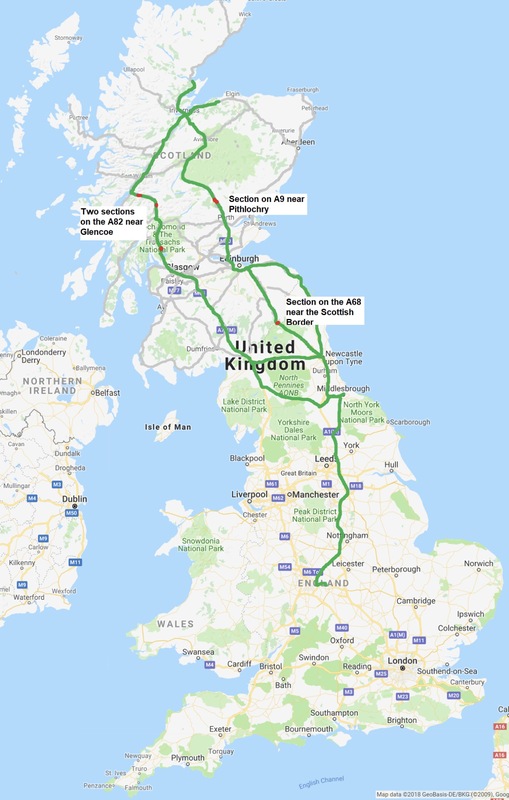 With the system above in place, a driver travelling between Edinburgh and Birmingham might initially get message warning of roadworks, diversions and other local hazards while leaving Edinburgh. As the driver proceeds on their journey, virtual VMS would display information from Traffic Scotland. 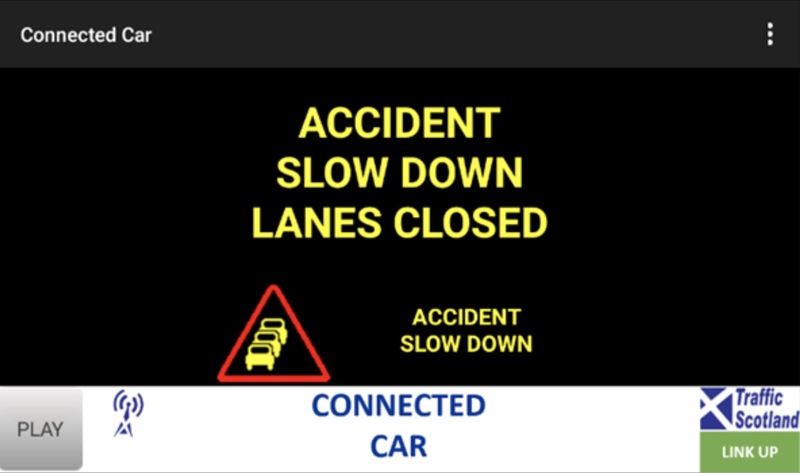 Travelling south, once in England, the driver would see VMS on local hazards from Highways England and then, on entering Birmingham, he or she will once again receive information regarding local city traffic conditions. 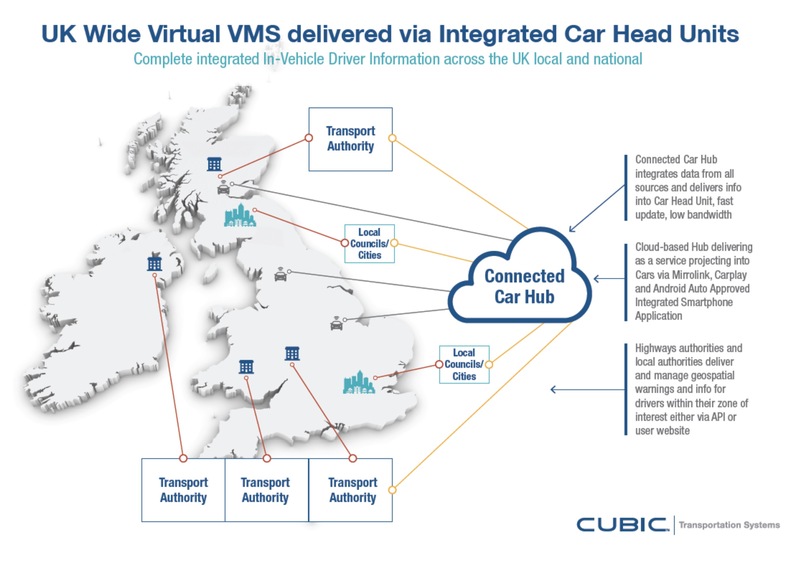 The virtual VMS system for Transport Scotland proposed by Cubic requires no investment in infrastructure or additional equipment in cars as it relies on existing 3G/4G communications and the infotainment systems already deployed in production cars. Earlier this year, Cubic demonstrated the system at CAV Scotland – a new event that brings together global experts in connected and autonomous vehicles (CAVs). The trial showcased virtual VMS using standard cellular communications and existing in-car equipment, with MirrorLink smartphone integration, showing notifications on car dashboard screen in real-time. For the trial, the company simply hired a current model VW Golf, plugged in the application and drove off. A test drive around Scotland demonstrated almost 100 percent operability (cellular network operational connectivity) on strategic routes in the Scottish Highlands. User trials are currently under consideration in Scotland, while a driving simulator study to evaluate distraction and compare the effectiveness of Virtual and Physical VMS has been proposed. Furthermore, implementations for Ford Sync, CarPlay, and Android Auto are being considered — subject to the necessary permissions. There’s no doubt that CAVs hold great promise in improving driver experience and safety. With a capable system that requires no new equipment in cars, is useable across a wide range of vehicles on the roads now, relies on standard cell communications and has demonstrated operability across the entire UK road network, Cubic Transportation Systems and Transport Scotland are a step away from delivering a practical, connected virtual VMS system that can be widely adopted to improve travel safety in the UK and beyond.